Research engineer Jonathan Ethier is taping a thin, floppy sheet of clear plastic to a piece of ordinary household drywall. Rows of patterns – squares and rectangles in this case – march across the plastic in straight, uniform rows. The sheet looks like one of those transparencies used for presentations on overhead projectors, which is technology that is still around but pretty outdated. This sheet of printed plastic – called an engineered surface – represents the future of fast, efficient wireless communications in our homes, our offices and indoor and outdoor public spaces. The sheet of plastic has been printed with metallic ink designed to capture radio frequencies and channels that directs them to be more efficient. This is similar to the fine mesh screen in the window of a microwave oven. The screen is designed to block any microwaves inside the oven from escaping while allowing light to pass through so we can see the food as it cooks. Engineered surfaces can also be embedded in drywall, wallpaper, window blinds, drapes, the backs of paintings, cubicle dividers in an office and a vast array of other surfaces to improve wireless connectivity. Jonathan is one of the scientists at the Communications Research Centre (CRC) collaborating with the National Research Council and the Printed Electronics Consortium to streamline and improve wireless access using engineered surfaces. 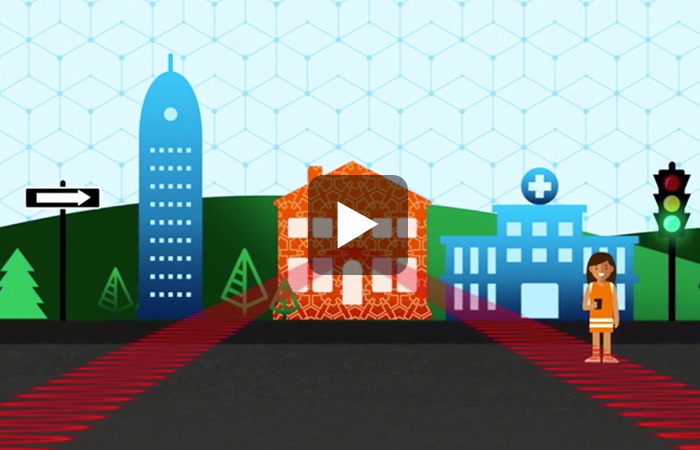 While this is still experimental technology, CRC's goal is to use engineered surfaces to provide everyone with quality wireless coverage, and prevent "dead zones" or areas where wireless reception is spotty and unreliable. For example, engineered surfaces can be used to direct wireless signals around corners, or bounce them off of other surfaces to achieve maximum coverage in an office or in our homes. "You could direct wireless frequencies to improve coverage to specific users," Jonathan says. And the applications don't stop there. Outdoors, engineered surfaces could be strategically embedded into billboards to make more efficient use of wireless signals, "or plastered right onto entire buildings," Jonathan says, resulting in significant cost savings. An engineered surface would be much cheaper to install than building a new cell tower for wireless transmissions, and simpler to deploy because they are not powered and just reflect radio waves to improve wireless coverage. Eventually, they could be included at the planning stage of new buildings, or even in the building codes, with engineered surfaces incorporated right into the construction materials. Engineered surfaces could also make more efficient use of portions of the spectrum, bypassing those sections that are already too crowded or over-used. Engineered surfaces could access or re-use those parts of the spectrum – the higher frequency millimeter waves – that are currently underused. Advances in engineered surfaces will support the growing demand expected with the advent of the fifth generation – 5G – of wireless communications and the Internet of Things , which will see an unprecedented surge in mobile devices, machines and technologies communicating not just person to person, but device to device. As Canada's primary advanced telecommunications research facility, the CRC focuses on wireless technology to support Canada as a world leader in improving, advancing and developing wireless telecommunications to benefit all Canadians. Contact us to learn more about our research on engineered surfaces, and other Grand Challenges research projects and collaboration opportunities.